Surface ProTM or any WindowsTM - based tablet. 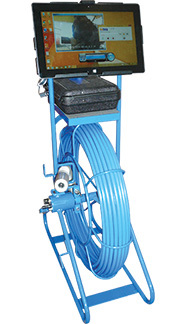 This digital system has a tablet retrofit on the cable reel using a swivel tablet holder with soft clamp. The tablet is used to view and record your inspection in digital format (MPEG) as well as take digital stills of major defects or observations (JPEG) on to the built-in-hardware. The unit will also record wirelessly on the Apple iPadTM or AndroidTM tablets using the optional Wi-Fi interface. Once completed, the recorded inspection can be copied to USB flash-drive within minutes and then can be given to your client immediately. As well, a detailed report of the inspection is also produced with your choice of printing or recording to the tablet’s built-in memory drive. And if your Tablet is connected to the internet via Wi-Fi you can upload your video directly to YouTube™ giving your customer instant information. The tablet is removable so that it can be brought into the office or home. This allows you to use it for other applications such as internet, word processing, accounting, email… etc. The control unit is built with Ratech’s standard easy-to-access rear mounted operating functions.